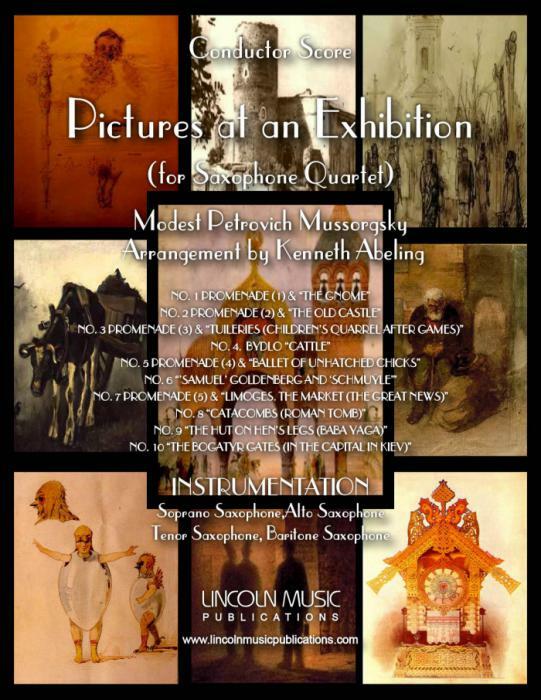 Pictures at an Exhibition by Modest Petrovich Mussorgsky transcribed here for Saxophone Quartet by Kenneth Abeling. This is an advanced transcription of the Promenades and all 10 Movements of the suite which Include: No. 1 Promenade (1) & “The Gnome”, No. 2 Promenade (2) & “The Old Castle”. No. 3 Promenade (3) & “Tuileries (Children’s Quarrel after Games)”, No. 4. Bydlo “Cattle”, No. 5 Promenade (4) & “Ballet of Unhatched Chicks”, No. 6 “’Samuel’ Goldenberg and ‘Schmuÿle’”, No. 7 Promenade (5) & “Limoges. The Market (The Great News)”, No. 8 “Catacombs (Roman Tomb)”, No. 9 “The Hut on Hen’s Legs (Baba Yaga)”, No. 10 “The Bogatyr Gates (In the Capital in Kiev)”. Plating Time approximately 32:00.